Coming from a family of woodworkers, Simon started out over 30 years ago as a traditional hand carver using axes and chisels. Eventually his artform evolved into large scale public art pieces and so he began using chainsaws as a means of sculpting. 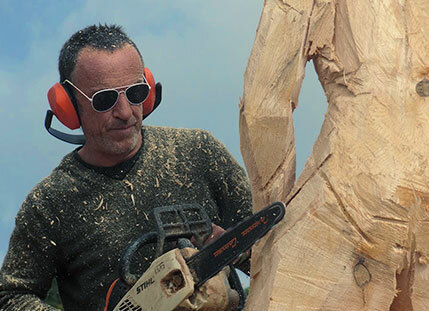 Participating in chainsaw carving events he began to travel with his work to Europe and America and met other artists from all over the world, which further inspired his artwork. From rally cars and flying jets to the soft flow of a running river and the delicacy of a flower, Simon can create anything that his clients are inspired by. 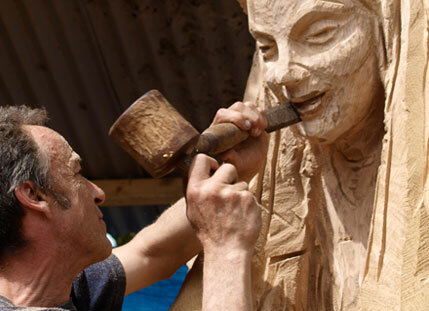 In the past, he has even been commissioned to carve an interpretation of the universe. 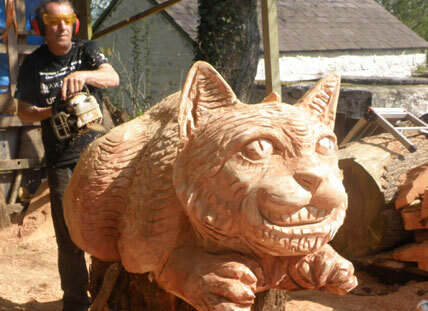 Being an active member of the Welsh community that he lives in, his carvings have been greatly inspired by the legends of the Celts and the deep rich history of Wales. He has been described in the past as a folk artist that leaves a sense of movement and spirit within the pieces he creates. Simon has full public liability insurance and full chainsaw certification.